Just picked this up to go along side Dunlop Fullbore Metal, the combination is perfect. Complete control over tones , many tones, I will have loads of fun trying all the different sounds. All in all, very pleased with this pedal, highly reccomend for anyone looking to clean up their metal tones! Another great pedal from Boss. I run two of them through the fx loop. One set for my rhythm sound, the other for leads. The only downside to this pedal is it takes some time and patience to get it dialed in just right, but that's not the fault of the unit. I play a iIbanez RG7 with active pickups through a pod HD unit. I found the tones were pretty good out of the Pod but that there was always a battle trying to get the proper definition and to make the notes really sing, BOOM Boss delivers again, this pedal allows me to Eq the tone Before it hists the POD which makes it Soooo much easyer to dial a tone properly, no hiss and bright warm Singing tones no need for the digital ( and tempermental ) Eq on the pod which saves me DSP for other effects I might like to add later and my tones Finally are sounding complete. best $100 I ever spent. if you are playing an Active pickup guitar and are finding your tones are not quite 100% to your liking I highly suggest buying one of these. I don't NEED this pedal I LOVE this pedal, it gets me more in depth then the Treble/Mid/Bass on my amp, which allows for maximum control over tone and I think it sounds amazing. possibly one of my favorite pedals! 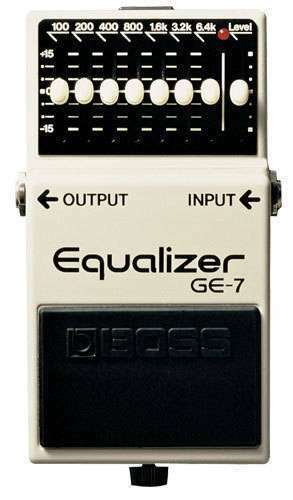 I have had one of these pedals since at least 25 years. It's been through a couple of wars and the only thing "wrong" with it is the plate on the top that tells you the frequencies of the sliders is loose but that's nothing that some glue or two sided tape can't fix. If that's all I can complain about then I guess I got my money's worth out of it. It's a real work horse that keeps on going. I mainly use it in my pedal board going through the effects loop of my tube pre-amp. I use it in the reverse of what people might think. I used to have it off while playing rythmn and then I'd turn it on during solos. But I thought there was a chance of running it too hot and I didn't want to fry anything. What I do now is turn the amp volume up to what I want for rythmn with the eg pedal set to what I want for sound with the level control at maybe 4 dB in the minus. Then when I want to solo I simply turn it off and the amp is running as if it isn't there. The solo sound isn't as harsh because the effects loop isn't running too hot. But like all Boss pedals of this style you'd have a very hard time killing the pedal under normal useage. One time my sound man had an eq die on him in the middle of the gig. A friend loaned him his Boss EQ and he ran it through the effects loop of the main board. It wasn't as useful as his now dead eq usually was but it saved the night and I honestly don't think any of the audience noticed.